Excellent text for research. I was pleased at how many of Dr. Rivers' source texts I have on my shelves already (The Rose Cottage Chronicles,Cracker Times And Pioneer Lives: The Florida Reminiscences Of George Gillett Keen And Sarah Pamela Williams, Anna Madgigine Jai Kingsley: African Princess, Florida Slave, Plantation Slaveowner,Echoes from a Distant Frontier: The Brown Sisters' Correspondence from Antebellum Florida). 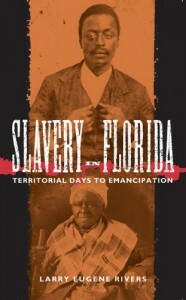 Slavery in Florida is a valuable and necessary addition to any research on antebellum Florida. I especially noted the point that the Second Seminole War was as much a slave revolt as an Indian uprising, something I tried to bring forward when writing Smuggler's Bride.